Epic Fantasy and Speculative fiction - history resources - free soundtrack album - plus free short stories, myths and tales, and complete novels. 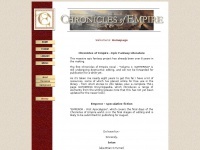 The web server used by Chroniclesofempire.net is run by SingleHop and is located in Chicago, USA. On this web server 37 other websites are hosted. The language of those websites is mostly english. Only a few websites on this web server are x-rated.